About myself: I'm a family man and I married my high school girlfriend 15 years ago. We have four children, 2 girls and 2 boys. I work for a welding wire manufacture and I do all their Die welding and some quality control product testing. I have been around archery and archery hunting since the age of 5. I've shot traditional and compound bows. I've hunted with Bows,muzzle loaders,shotguns,handguns,and riffles. 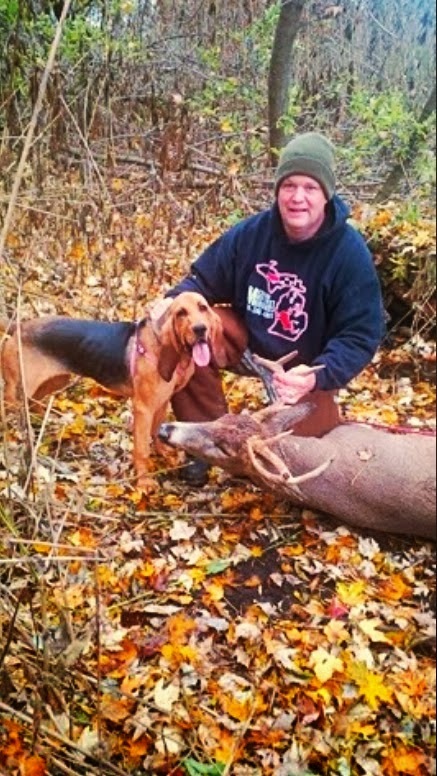 I have Literally stopped hunting to focus on dog training and tracking wounded deer with dogs as a professional. I charge for my services and to be honest I do charge fair amount for my services. I feel the effort I have gone to purchase one of the best tracking bloodlines in the United States and even in Europe. The year round care and the time I have spend with her working on obedience and cold scent training and the time I take off from work and the many hours away from my family and the several thousand miles I put on my vehicle in the end I typically break even. 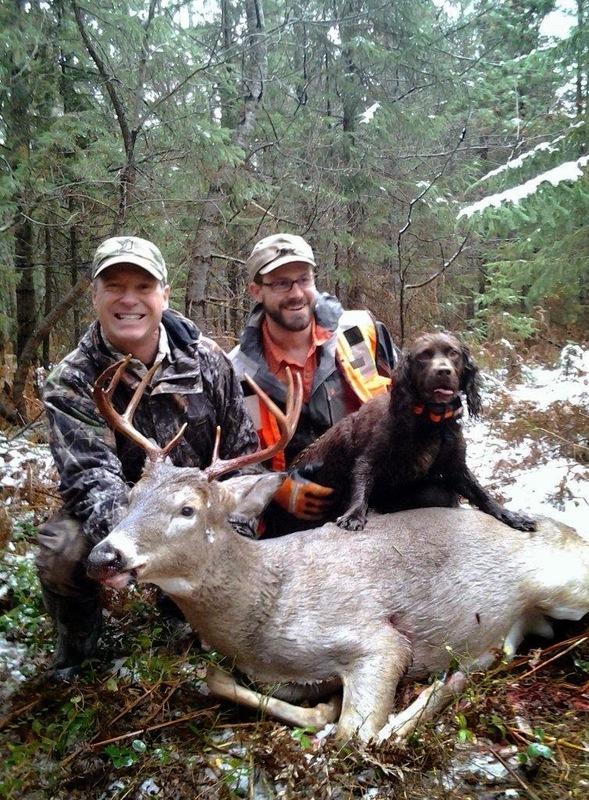 I started tracking wounded whitetails with dogs back in 2007/2008. My first tracking dog is a mini chocolate & tan dachshund and his name is Scout. Scout is basically retired. I will still use him when I need to give Sypris a break. He has recovered 36 deer. My new hound is Sypris, she is 4 years old and weighs 21# and she is a European Dachshund. Last year she found 32 deer and a career total of 41deer. 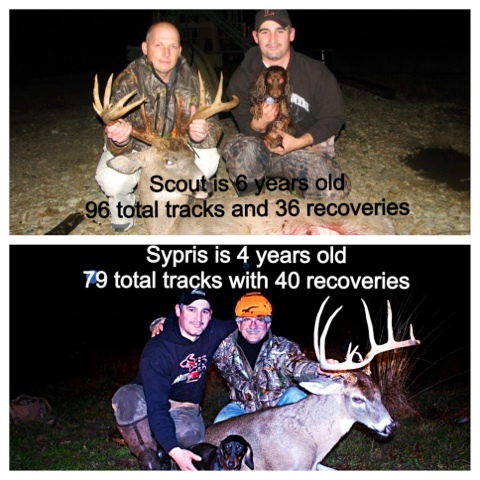 Going in to my 6th year tracking and have gone on over 170+ tracks I have realized that you can not comprehend the whitetails strength and desire to survive. One advantage I have over most hunters is I have tracked so many mature Whitetails I can look at the lay of the land and sometimes predict the mature deer exit routes. So when the hound is struggling I can help assist my dog by applying past experience and maybe visual cut a track or find blood to get the dog refocused. I truly feel my specialty is tracking mature whitetail bucks!!!! I live in Genesee Co. and the areas I mainly track are Genesee, Livingston, shiawasee, Oakland, Lapeer, counties. In the past I have driven all over our state and this upcoming season I'm going to try and stay closer to home as much as possible. I will travel as far as the southern Michigan boarder and to port huron to Grand Rapids to northern lower Peninsula. Please call and leave me a message and typically I can respond much faster with a text. When you call or text please give me as much info as you can this will help speed up the process so I can get to your location much sooner or get another tracker to help you. When you call I can assure ill be asking all kind of CSI type questions!!! I will always return you call and if I can not track for you I will find another MDTH tracker or use a tracker that I have in my Rolodex. 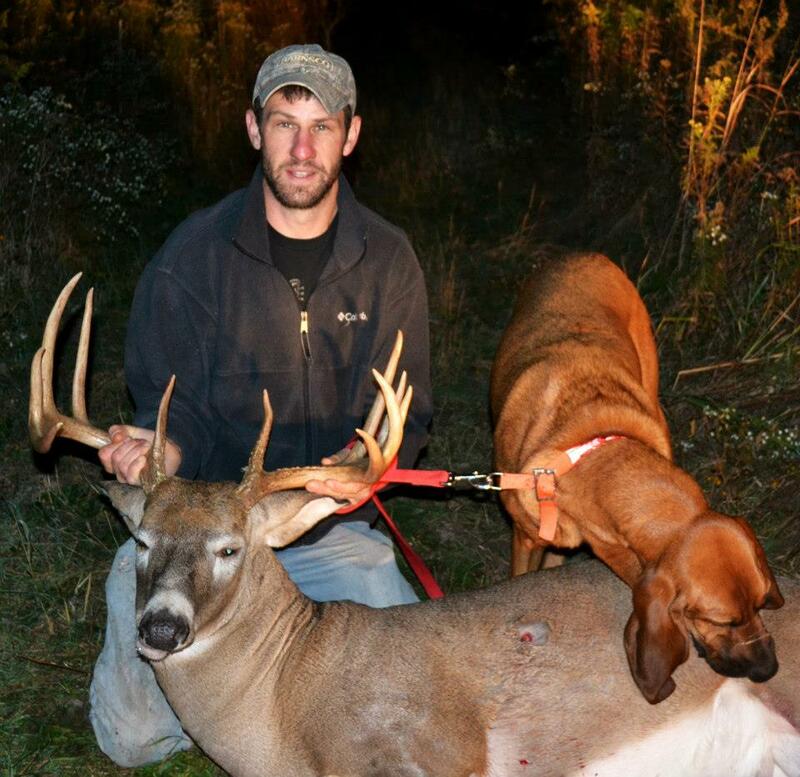 I also know a lot of trackers in other states that I can help you when you go on out of state hunts. So hopefully you know a little more about me and I hope you never need to use a tracking dog however we are hear to help you if your blood trail runs cold. Three things I ask ever hunter to try and do. 1- Back out when in doubt. 2- Call a tracker as soon as you realize your in trouble. 3- Locate a tracker near you before your hunting season starts. Best of luck to you and your family this upcoming season.